I generally tend to ignore people like him but Nick Griffin, leader of the far right BNP, has been elected an an MEP or a Member of European Parliament by the British people, so its just fair to highlight his views. 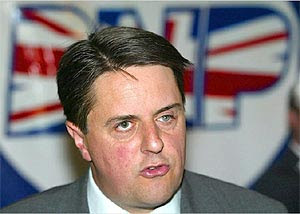 Boats carrying illegal migrants to Europe should be sunk Nick Griffin, the leader of the British National party, said yesterday. In a provocative intervention, Griffin, elected to the European parliament last month, called on the EU to introduce "very tough" measures to prevent illegal migrants entering Europe from Africa. "If there's measures to set up some kind of force or to help, say the Italians, set up a force which actually blocks the Mediterranean then we'd support that," Griffin told BBC Parliament's The Record Europe. "But the only measure, sooner or later, which is going to stop immigration and stop large numbers of sub-Saharan Africans dying on the way to get over here is to get very tough with those coming over. Frankly, they need to sink several of those boats. Anyone coming up with measures like that, we'll support, but anything which is there as a 'oh, we need to do something about it' but in the end doing something about it means bringing them into Europe we will oppose." Shirin Wheeler, the programme's presenter, interrupted him to say the EU did not murder people. "I didn't say anyone should be murdered at sea – I say boats should be sunk, they can throw them a life raft and they can go back to Libya," Griffin said. "But Europe has, sooner or later, to close its borders or it's simply going to be swamped by the third world." Griffin's comments were especially controversial because many thousands of migrants from sub-Saharan Africa attempt to make the crossing to Europe on rickety boats during the summer. Many land on Lampedusa, the Italian island less than 100 miles from Tunisia. The BBC said 37,000 migrants landed on Italian shores last year, a 75% increase on the year before. Italy gave Libya three patrol boats in May to help control the number of migrants crossing the Mediterranean. The BBC reported that Roberto Maroni, the Italian interior minister, a member of the anti-immigration Northern League, had described the first 200 migrants returned to Libya as a "historic" moment.